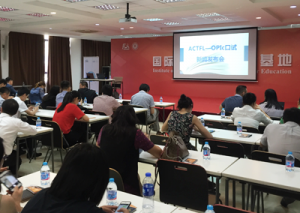 The Oral Proficiency Interview computer system (OPIc), developed by the American Council on the Teaching of Foreign Languages (ACTFL), was recently introduced in Shanghai to assist those seeking employment with international companies to demonstrate their proficiency. Currently, the OPIc covers 13 languages and five of them, English, Russian, Japanese, Korean and Spanish, are now available in China. More languages are being added regularly as the one-on-one interview system includes nearly 120 languages. The system was brought to China by Chinese Testing International and the stated-owned human resources agency China International Intellectech (Shanghai) Corp.
Lisa March is a bilingual Marketing and Sales Executive. She works closely with LTI on strategic partnerships, business development and marketing. Her efforts help LTI scale the use and implementation of language assessments in schools, institutions, corporations and government agencies. How will I share the AAPPL results with parents?